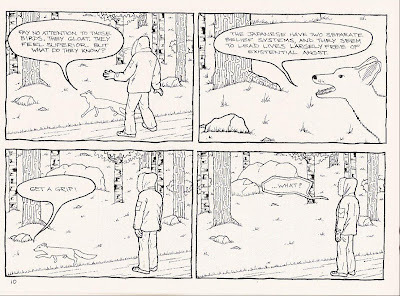 In issue one of Entropy, the protagonist, oddly overdressed for a mild walk along a wooded road, contemplates creation myths and converses with the woodland creatures. Costain lends a level of anxiety to his tale even before the pesky ravens assail his lone traveler. This fellow is anxious about the ravens but also concerned about creation. He tries his hand at deity to no avail (at first). Then, to mess with his peaceful day, the ravens arrive. The art in the first issue of Entropy reminded me a bit of the art in Jiro Taniguchi’s excellent The Walking Man (Fanfare/Ponent Mon). The lines of the trees and leaves are ultra detailed, giving the setting a degree of hyper-reality. 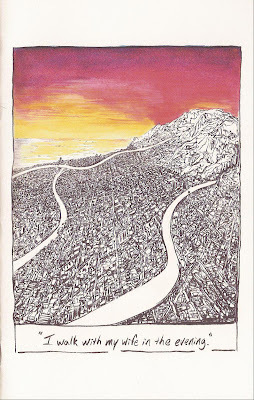 The level of detail isn’t quite as defined as Taniguchi's, but the comparison is still useful as a point of reference. 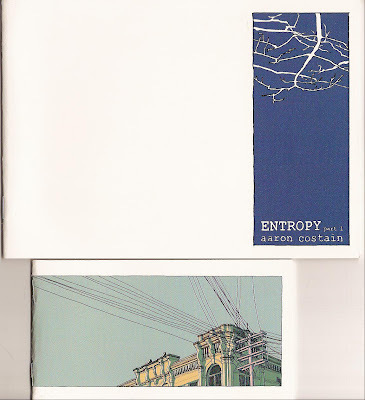 Issue two of Entropy is a bit of a departure from issue one. The cover is gorgeous enough to consider for a print; I’d hang a print of that on my office wall in a second. The departure comes from the subject matter and ultimately the reduced size of this mini. It’s broken up into two stories; the longer, “the SHAME that made a MAN out of MAC,” and the brief “automatism 1.” In “the SHAME,” Mac keeps getting flat tires (3 of them!) on his bicycle. The first two times, he rolls his bike to The Bike Clinic for a flat tire repair. You get the sense that Mac thinks the gods are mocking him with the repeated flats. By the time flat tire number three arrives, Mac decides to take matters into his own hands, and thus he becomes – a MAN. The art in issue two is less detailed than issue number one, especially in the second story, “automatism 1.” The art here is much looser, a function of the tiny panels (eight of them) crowded onto each page. This doesn’t ruin the art, but it forces Aaron to use less detail and rely on simple lines. It works pretty well. 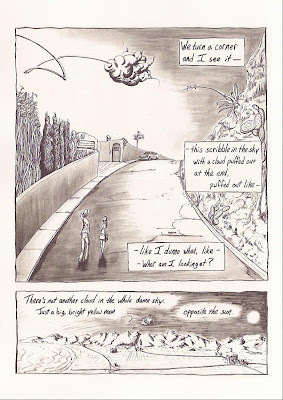 You can get more information on Entropy and look at more of Aaron’s comics at his website. 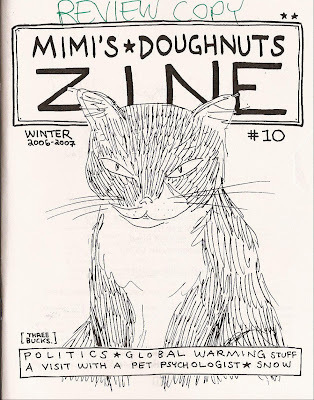 The front cover of Mimi’s Doughnut Zine reads “Politics, Global Warming Stuff, A Visit with a Pet Psychologist, and Snow.” That’s exactly what you get in this 36-page mini. After a short story about a manipulating local politician, and a well drafted science lesson on global warming, you get the real heart of this book – a 20-page tale of an emotionally imbalanced dog regaining it’s mental health. As in most cases of dog problems, this problem lies in the behavior of the humans surrounding the dog. Kody is a pretty good dog, but he has major separation anxiety. It’s so bad that he destroys furniture and threatens his own well being. So they go take Kody to a pet shrink, who tells them that they are the problem. All ends well, but Marek cruelly hints at darker times to come in one menacing panel. 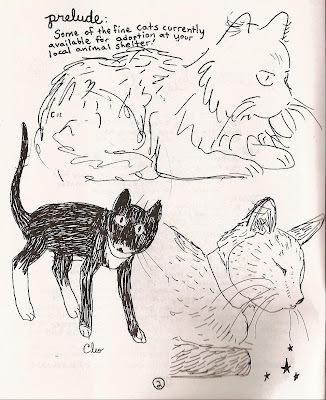 Mimi’s Doughnuts Zine is $3 and you can get your copy by visiting Marek’s website. 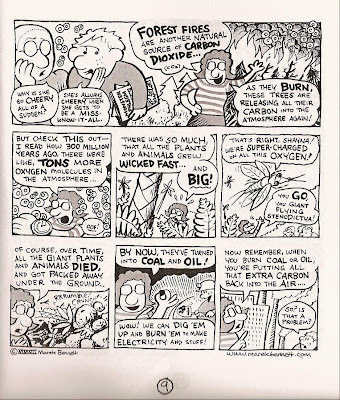 Also check out archived strips of Mimi's Doughnuts. Over 18 pages and an early evening walk, Christopher Davis fantasizes about an ominous cloud in the sky. He and his wife take a routine walk, but his thoughts are of the fantastic – dirty bombs, nuclear war, gas masks, body bags, and death of a massive scale. Christopher’s art is well suited for a grand scale. Almost every panel, regardless of the size, stretches to the ominous sky. Dark shading lurks then creeps from the panel borders. 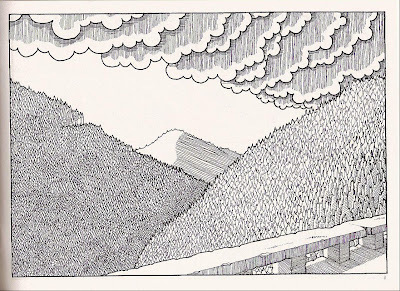 Christopher’s inking is very subtle, allowing the moodiness of the penciled art underneath to shine. As foreboding as the story is, it begins and ends in lightness (and reality). The inside of both covers are very simple, no background or shaded sky. It really brings you back to present tense after the escape of the story. Christopher also sent in a few other minis, including ”No Buses. 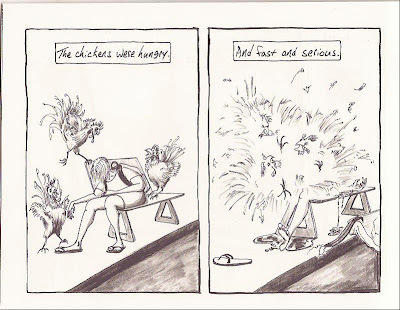 Chickens. I have to share this image. I featured a couple of Christopher’s minis back in March of last year. Good to see he’s still going strong. No prices on either of these, but give him a shout at squawkalong@yahoo.com for details. Back from St. Thomas and S.P.A.C.E. Reminder Kate and I have been in St. Thomas for a wedding, so I haven't been posting mini-comic stuff or answering emails. Having so much fun is kind of exhasuting, but I'll get back to business tomorrow. Please don't forget that S.P.A.C.E. is this coming weekend in Columbus, Ohio. Good pal Matt Dembicki and S.P.A.C.E. organizors will be holding raffles to support Mike Roden, so look out for that. Brooklyn-based Partyka artists Shawn Cheng and Sara Edward-Corbett deliver this well-crafted and ultra charming mini based on a Japanese folktale. The Monkey & the Crab is wrapped in a silver silk screened cover punched and tied together with purple yarn. Inside is the usual high quality Partyka mini-comic. 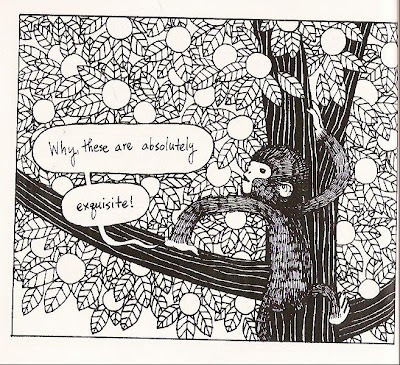 The monkey finds a persimmon seed; at the same time the crab finds a dumpling. The conniving monkey jealously eyes the crab’s dumpling. The crab eloquently shows the monkey that a persimmon seed, once planted and tended, provides a lifetime of sustenance, while the dumpling only gives a moment’s satisfaction. 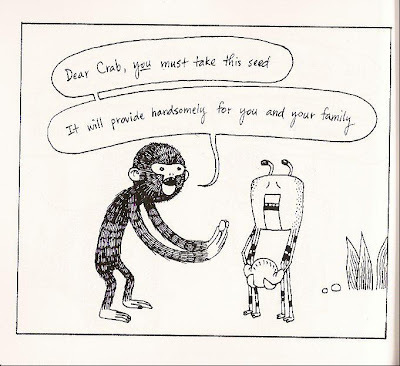 The monkey, a vagabond without a family, then forces a trade with the crab who has a family to support. After reluctantly agreeing to the exchange, the crab carefully tends and nurtures his persimmon seed. The seed grows to a beautiful and fecund tree, capable of feeding the crab’s family and friends. Then the jealous and hungry monkey comes back. 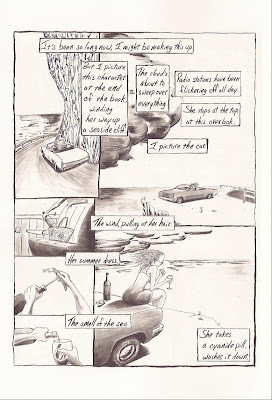 This is a fantastic mini-comic – compact, moving, and eloquent. It’s a fairy tale and a moral lesson neatly packaged in a striking cover. 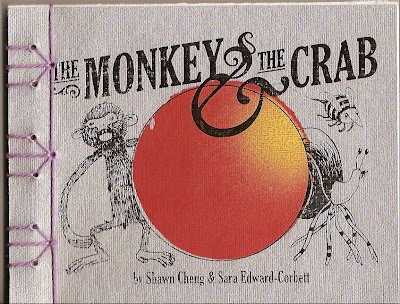 Purchase the 64-page The Monkey & the Crab at the Partyka webstore for $7. Check out sample art from their other minis while you’re there. The Partyka gang puts out some of the best mini-comics you’ll ever find. Stay tuned for a review of Matt Wiegle’s fish tale Seven More Days of Not Getting Eaten. Come rock and roll with us! In a round room! PictureBox is a Grammy-Award winning publisher and visual culture studio based in Brooklyn, New York. Led by art director and editor Dan Nadel, PictureBox specializes in bringing artists' visions to print in startling and unexpected ways. Nadel art directs and oversees all PictureBox projects, from CDs to posters to books. Amy Lockhart is a Vancouver-based filmmaker, animator and painter. She'll be screening some of her short films collected under the moniker Walk For Walk. Matthew Thurber is a Brooklyn-based cartoonist and musician who creates 19th century versions of multi-media performances with masks, scrolls, and a small guitar. 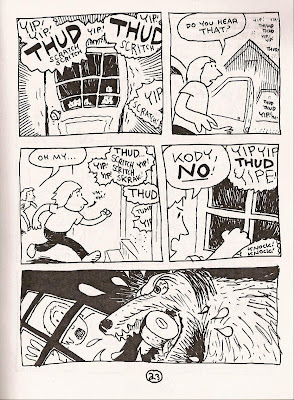 Gary Panter is the legendary artist behind Jimbo and the designer of Pee Wee's Playhouse. His paintings, comics, and graphics have influenced generations of artists. He will be performing vocal and guitar songs for the first time in over three decades. Appearing with Panter will be Devin Flynn. Devin Flynn is part of the bands Plate Tectonics and Gangstahs Wit Gats and has a cartoon show on Adult Swim's website." 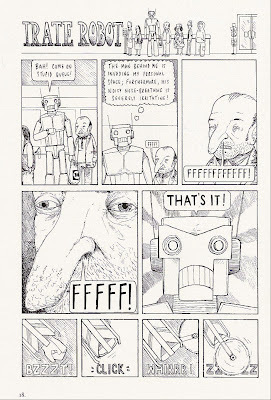 An irate robot (in Irate Robot!) grows tired of standing in line with a bunch of mouthbreather humans. This robot has a circular saw blade for a hand and… well things don’t end so well for the annoying human standing behind him. God enlists a physically broken angel to battle a terrible demon on earth. The angel defeats the demon and God grants him any wish as a reward. The angel gets his reward, but doesn’t watch where he is standing when he teleports to earth. Things get nasty. That last sentence describes how every Banal Pig story ends. “Things get nasty.” Every story is brutally mean, but they're often just as funny. Every tale here makes you smirk and feel a bit bad about yourself for smiling. Steven's art is always solid as he switches back and forth from sharks, pigs, humans, robots, cats, and angels. 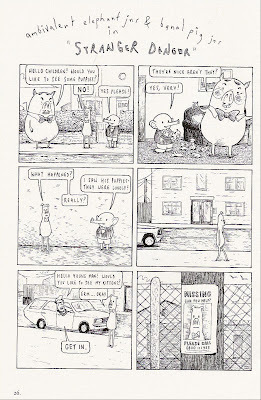 Check out Banal Pig for yourself at Steven’s website, MySpacePage, or blog. 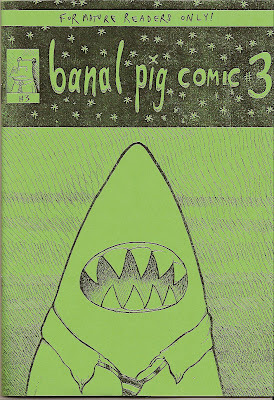 Banal Pig #3 is 26 pages and 4 pounds (roughly $8, damn weak dollar).